According to a legend post-dating the Dissolution of the Monasteries by Henry VIII, when Joseph of Arimathea, great-uncle of Jesus, first arrived in Britain he landed at Glastonbury; planting his staff in the ground, it set down roots and was transformed into a hawthorn that miraculously flowers on Christmas Day. 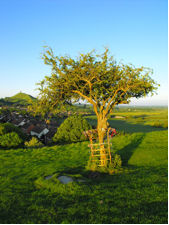 Until recently this thorn tree was still to be seen, alive, upon Wearyall Hill at Glastonbury. 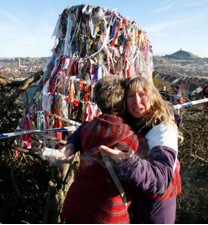 Its destruction in December 2010 elicited considerable grief and anger among the inhabitants of this Western English town, an eminent British site of religious pilgrimage and the focal point for a variety of neo-pagan, New Age and heterodox Christian groups. Whilst the perpetrators of this latest act of desecration are unknown, historically the persistence of the medieval cult of relics at Glastonbury has been met with a marked ambivalence from Christian quarters. As Walsham has shown, in the post-Reformation era the Glastonbury Thorn became something of a symbol for the resilience of Catholic-pagan survivals in folk belief, and the Thorn was twice the target of Puritan axes. At present I am conducting research into the historical relationship of twentieth century esotericism at Glastonbury to the town’s confessional history, focusing in particular on the union of esoteric notions of the prisca theologia with post-Reformation discourse on the primacy of a primitive British Church. My work is also concerned with the infiltration of esoteric notions into the shifting antiquarian and archaeological significance of the post-Reformation sacred landscape at Glastonbury, and the transformations effected upon that landscape by the folkloric and esoteric traditions in question. Today I will briefly sketch some basic lineaments of this research. … and after its destruction on December 9, 2010. 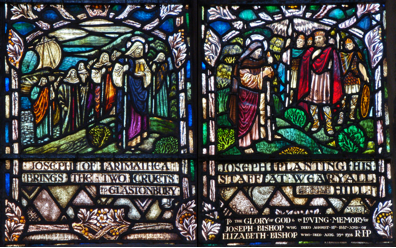 At the heart of the Glastonbury cult of relics lies an intricate web of legends and pseudo-histories spawned by the vicissitudes of medieval monastic economic and political life. Let us turn first to the identification of Glastonbury with Avalon. A Saxon life of St. Dunstan written around 1000 AD makes mention of a “certain royal island on the boundary of western Britain” where the first British church was built; drawing on the imagery of the descent of the New Jerusalem given in the Book of Revelations, it is said this church was not made by human artifice but prepared by God Himself for the salvation of men. Some 200 years later, following the destruction of Glastonbury Abbey by fire in 1184, an interpolator of William of Malmesbury’s De antiquitate Glastonie ecclesie identified this royal island with both Avalon, the legendary resting place of King Arthur, and with Glastonbury itself, which had lain as an isle amidst wetlands prior to the medieval drainage of the Somerset Levels. The identification appears to have been an economically motivated solution to the abbey’s flagging fortunes following the fire, which were revived by the opportune discovery in the abbey grounds of the supposed grave of Arthur and Guinevere in 1191. Joseph of Arimathea arrives at Glastonbury. Stained glass, Church of St. John the Baptist, Glastonbury, 1935. The Island of Avalon, eager for the death of pagans, at the burial of them all will be decorated beyond the others in the world with the soothsaying spheres of the prophecy, and in the future will be adorned with those who praise the Most High. Abbadare, powerful in Saphat, most noble of the pagans, took his sleep there with 104,000 men. Among these Joseph of Arimathea received eternal slumber in a marble tomb, and he lies on a divided line next to the oratory’s southern corner where the wickerwork is constructed above the mighty and venerable Maiden, and where the aforesaid thirteen spheres rest. Joseph has with him in the sarcophagus two white and silver vessels, full of the blood and sweat of the prophet Jesus. Once his sarcophagus is discovered, [he] will be visible, whole and undecayed, and open to the whole world. From then on those who dwell in that noble island will lack neither water nor the dew of heaven. 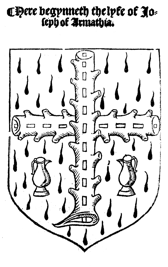 The coat of arms of Glastonbury Abbey, depicting the cruets, holy thorn and blood of Christ. From The Lyfe of Joseph of Armathia (1520). It is notable that the Grail has been substituted in this text with two vessels containing the blood and sweat of Jesus – these are the cruets portrayed on the coat of arms of Glastonbury Abbey. The medieval inventories of Glastonbury Abbey’s relics do not list these vessels, which appear to be of a purely imaginative character; but the transfiguring power of their contents, apparent in the allusion to the heavenly manna and the undecayed state of the body of Joseph, would become the basis for their later association with the red and white Philosophers’ Stones, the alchemical agents of transmutation. It is also noteworthy that the Melkin prophecy’s motif of a millennialist restoration contingent upon the opening of a tomb bearing a transfigured corpse bears an important resemblance to more narrowly esoteric motifs, most notably the opening of the tombs of Hermes Trismegistus and Christian Rosenkreutz. ‘Tis generally reported that Doctor Dee, and Sir Edward Kelly were so strangely fortunate, as to finde a very large quantity of the Elixir in some part of the Ruines of Glastenbury-Abbey. This is evidently a piece of folklore, as Dee’s diaries only mention that Edward Kelley was directed by spirits to Northwick Hill in the Cotswolds, where he discovered a “boke of magik and alchimie” attributed to St. Dunstan, a “red congealed” powder within a “hollow stone” and a cipher scroll detailing the location of ten buried treasure troves. We are dealing here specifically with esoteric folklore of a kind common throughout early modern Europe, as high magical and alchemical motifs were incorporated into oral folk tradition, from whence they often exercised a reciprocal influence on esoteric lore proper. Some insight into the exact process by which Dee’s account of the unearthing of the elixir became associated with Glastonbury can be garnered from a variation of the story given in 1671 by Daniel Morhof, who writes that Kelley was passing through an unnamed town on his return from Wales to England when he found a book written in “ancient Welsh” in a trader’s shop window. Inquiring as to its provenance, Kelley learnt the trader and other commoners had taken the opportunity granted by the Reformation to plunder the tomb of a bishop in search of treasure – but all they had discovered, to their disappointment, was the book along with two ivory spheres containing white and red powders. Kelley promptly paid one pound for these items and returned with them to Dee’s house at Mortlake. For they say that Joseph of Arimathea brought with him two vials of water and blood, the washing of our Saviour’s wounds, which were kept in a square niche on the north side of the high altar, from which niche the Papists have scraped away the free stone and broken off pieces of a harder stone at bottom to carry it away out of devotion. In the wake of the Reformation the destruction of the abbey remnants continued apace, principally at the hands of certain local landholders, who had a reputation for possessing an iconoclastic Protestant spirit, and who regularly plundered the ruins for building material. In the 1720’s the antiquarian William Stukeley lamented the “barbarous havoc” wreaked by a “Presbyterian tenant” upon the remnants of St. Joseph’s Chapel; and just as the attempted destruction of the Glastonbury Thorn had engendered tales of divine vengeance visited upon the perpetrators, so too the desecration of the abbey ruins gave rise to popular narratives of sacrilege and retribution directed principally against the instrumental rationality of the Calvinistically oriented Protestant Dissenters. Thus the eighteenth century decline in the Glastonbury economy was widely blamed upon the building of a new market house with stone from the abbey ruins. Glastonbury and its ruined abbey in the mid-seventeenth century. Dugdale, Monasticon Anglicanum, I, 1655. 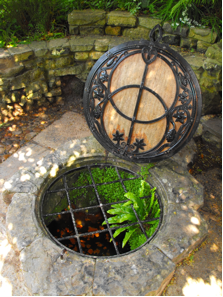 St. Joseph’s Well, Glastonbury Abbey. unsigned and closed off by an iron gate due to health and safety regulations. 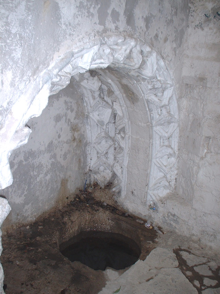 There is no record of a medieval cult relating to either the Chalice Well or the Well of St. Joseph; the Chalice Well first comes to prominence only in October of 1750, when a local asthmatic by the name of Matthew Chancellor was directed by an angel in a dream to drink from its waters, which at that time ran in a partially subterranean conduit to the chain gate at the abbey. According to the angel, the waters possessed curative power due to the “vast number of saints and martyrs” buried in the holy ground there; this is another mythologem with folkloric roots, which are also evident in an earlier eighteenth century account of a bloody spring that emerged at the house of a farmer who had participated in the murder of the last abbot. News of Chancellor’s dream and subsequent cure led to tens of thousands of visitors flocking to the waters of the Chalice Well, which is also referred to in contemporary accounts as the Blood Spring and the Spring of Joseph of Arimathea. The water was even bottled en masse and sold at the Universal Register Office in London; however, the unsanitary condition of the conduit led to deaths and a rapid decline in custom, while the bathhouse built in anticipation of a permanent reversal of Glastonbury’s ebbing fortunes soon fell into disuse. The resurgence of the Chalice Well and the dawn of contemporary esotericism at Glastonbury can be traced to a curious event of September 1906, when a clairvoyant by the name of Katharine Tudor Pole uncovered a mysterious glass vessel from the mud of a sluice near Wearyall Hill, subsequently named St. Bride’s Well. Her brother, Wellesley Tudor Pole, an associate of the Golden Dawn, claimed he had seen the place in a “waking dream” and directed her there along with two of her friends, who together formed a “triad of maidens” necessary for the unearthing of the holy relic. Despite contemporary newspaper accounts proclaiming the discovery of the Holy Grail and the downfall of the materialistic science of the Victorian age, the finding was less than miraculous, given that Tudor Pole knew the man who had placed the object at the sluice in the first place – John Goodchild, who had paid six pounds for it in a Ligurian tailor’s shop. Goodchild was a spiritual disciple of William Sharp, the Golden Dawn member writing under the name of Fiona Macleod; and while late Victorian medievalism was a decisive influence, it is also in the context of the Celtic revival promoted by Sharp and W. B. Yeats that the rise of esoteric Glastonbury should be understood. Thus Goodchild in his turn had been told in a vision he must place this Chalice at “the women’s quarter” at Glastonbury so that its discovery would serve as a “means of moulding Christian thought”, i.e. of restoring the cult of the earth mother to patriarchal Christianity. 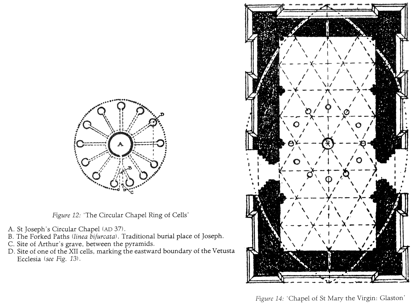 The vesica of the Lady Chapel (right) and the thirteen ‘spheres’ from the prophecy of Melkin (left); note the linea bifurcata marking St. Joseph’s tomb. From Frederick Bligh Bond, The Mystery of Glastonbury (1930). The coming of the so-called Avalonians to Glastonbury created difficulties for the Anglican Church hierarchy from the outset. Archdeacon Wilberforce, Canon of Westminster, initially declared Goodchild’s cup to be the Holy Grail itself, only to be contradicted by an expert consensus that it was “fairly modern”. More serious difficulties arose due to the Church’s appointment in 1908 of Frederick Bligh Bond as director of excavations at its newly acquired site, Glastonbury Abbey. Bligh Bond was also a friend of Goodchild’s, and declared himself to be the first man to apply “psychical research methods to archaeological work” – through the automatic writing of mediums he made contact with the so-called Watchers or “Company of Avalon”, spirits of the Glastonbury dead who directed him to undiscovered structures amidst the abbey ruins. These had been constructed in accordance with the “aeonial” or archetypal rules of gematria, which Bligh Bond extrapolated not from Kabbalistic sources but rather from the pre-Kabbalistic isopsephy of the Gnostics. In accordance with Goodchild’s British Israelite beliefs, Bligh Bond portrayed the druids as the lost tribe of Israel who had conveyed this prisca sapientia to the British Isles, and whose legacy was readily discernible in the cryptic description of St. Joseph’s Chapel given in the prophecy of Melkin. Bligh Bond placed particular emphasis on the form of the feminine vesica or yoni underlying the proportions of the Lady Chapel that superseded St. Joseph’s Chapel; it was a design he also incorporated into a wrought-iron cover for the Chalice Well, which had been acquired by the feminist and Christian socialist Alice Buckton in 1912. To this day it continues to constitute Glastonbury’s most potent symbol for the reinstatement of the feminine within the religion of the West. The Chalice Well: wrought-iron cover with vesica piscis design created by Frederick Bligh Bond c. 1918. Then as now, the Anglican Church hierarchy was less than enamoured with this late flowering of the druidic prisca theologia. Unconvinced by Bligh Bond’s esoteric archaeology, the Diocese of Bath and Wells duly terminated his appointment in 1923. Yet Bligh Bond’s ideas were far from new – in his work of 1741, Stonehenge, A Temple Restor’d to the British Druids, William Stukeley himself had argued for the Jewish patriarchal origins of the druids, and had perceived their sacred geometry in the circles of Stonehenge, which he correlated with the architecture of the temple of Solomon. Stukeley drew in his turn upon a post-Reformation English discourse asserting the primacy of a primitive British apostolic Church over and against the Romish faith brought to the British Isles in the sixth century by Saint Augustine, the first Archbishop of Canterbury. Thus Jacobean writers such as Bishop Francis Godwin and the antiquarian William Camden had argued a Druidic prisca theologia paved the way for Christianity in Britain, citing as proof Origen’s alleged statement that the Britons of the second century AD were already Christians. As the legendary site of Joseph of Arimathea’s first church, Glastonbury held a special place in this national mythology; indeed, in the course of the eighteenth century the notion arose that Joseph had chosen Glastonbury precisely because it lay at the very heart of Druidic worship in Britain, surrounded by stone circles that constituted microcosmic models of the heliocentric Pythagorean macrocosm of the druids. 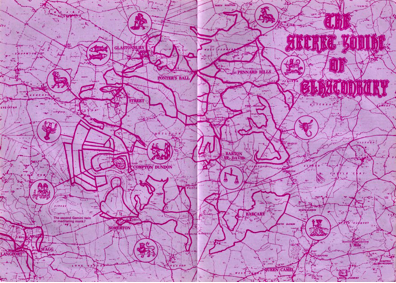 The Glastonbury Zodiac, as depicted in Gandalf’s Garden magazine (1969). One of the most intriguing pieces of esoteric pseudo-history from Glastonbury to have infiltrated the scholarly literature regards a similar archaeological over-interpretation. In a book of 1968 entitled John Dee, Richard Deacon stated that Dee had made a map of the prehistoric earthworks in the Glastonbury area, and that he had interpreted them as the constellations of the Zodiac plotted out upon the ground. The map in question was said by Deacon to reside at the Warburg Institute; yet it mysteriously disappeared soon after his sighting of it, and despite a prolonged search has not been seen since. This alleged disappearance has itself become further evidence of a supernatural conspiracy in the eyes of contemporary neo-pagans at Glastonbury; nevertheless, the quoted passage Deacon supplies is clearly a poor attempt at the fabrication of early modern English, and his pseudo-history is merely an elaboration upon the Glastonbury Zodiac theory of the Theosophically-inclined artist Katherine Maltwood, who in 1929 first perceived this immense terrestrial Zodiac in aerial survey maps of the area. According to Maltwood, who was illustrating the 13th century High History of the Holy Grail at the time, the Glastonbury Zodiac had been constructed by Sumerians in 3000 BC and represented stages in the quest for the Grail itself. Another pressing problem I wish to address with this research, and an important task facing our field overall, pertains to the role of psychological factors in the genesis of esoteric belief and practice. The esoteric mindset as defined by Faivre corresponds in many particulars with what may be termed an ‘esoteric schizotypy’, in accordance with a contemporary psychiatric category encompassing a broad spectrum of personalities exhibiting schizotypal traits (e.g. visual and auditory hallucinations, paranoid or conspiratorial ideation, a tendency to distant associations); of particular significance in this regard is the phenomenon of ‘apophenia’, the discovery of meaningful patterns in apparently random data that we find exemplified in the creative interpretations of Glastonbury’s sacred landscape I have touched upon today. My purpose in this regard is not to psychopathologize esotericism, but rather to understand the interaction of dominant and deviant psychologies within those processes of marginalization that currently constitute a central historiographical concern of our field. Finally, there is also the problem of academic access to esoteric sources. I had been hoping to inspect the archives of the Chalice Well Trust, but I was told the general public is not yet ready for the details of the magical warfare waged against Hitler by the Avalonians Wellesley Tudor Pole and Dion Fortune, apparently with the connivance of Winston Churchill himself. So this particular theme, be it esoteric fact or pseudo-history, must await another talk.